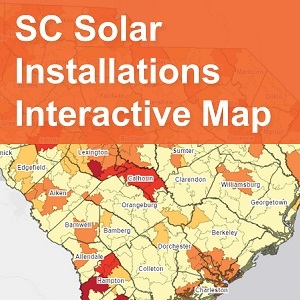 South Carolina law “encourage(s) the development and use of indigenous, renewable energy resources.” Renewable energy, which includes biomass, wind, solar, hydropower, geothermal, and hydrogen derived from renewable sources can mitigate South Carolina’s dependence on imported energy and help meet state air quality goals. The Energy Office has focused its efforts on developing biomass, solar, and wind energy sectors, although the office is supportive of all economic development related to renewable energy. For additional information, please click on the sources below. Solar energy, radiant light and heat from the sun, utilizes the light from the sun to produce power. Unlike fossil fuels, solar energy is available anywhere on earth. Solar energy is free, immune to rising energy prices, and can be used to provide heat, lighting, mechanical power and electricity. Solar energy technologies include solar heating, solar photovoltaics, solar thermal electricity, solar architecture and artificial photosynthesis, which can make considerable contributions to solving some of the most urgent energy problems the world now faces. Solar technologies are broadly characterized as either passive solar or active solar depending on the way they capture, convert and distribute solar energy. Active solar techniques include the use of photovoltaic panels (solar panels) and solar thermal collectors to harness the energy. Passive solar techniques include orienting a building to the Sun, selecting materials with favorable thermal mass or light dispersing properties, and designing spaces that naturally circulate air. View an animation demonstrating how solar works and how shade can effect solar performance. Please note this data is from SCE&G, Santee Cooper, and Duke Energy as of July 2018 only and is self-reported from the electric providers.